It’s a quibble usually uttered by petulant children, listless students, and disenfranchised desk jockeys. 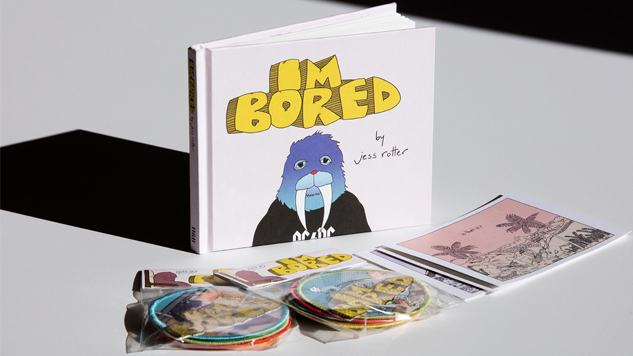 Yet, in the capable hands of Los Angeles-based illustrator, designer, entrepreneur and debut-author Jess Rotter, “I’m bored” becomes a statement of social commentary. “I’m bored” becomes the lethargic rallying cry (emphasis more on the crying than the rallying) among those who are just over it. “It,” of course, meaning anything from this year’s toxic presidential election to the incessant nature by which we check our phones to the exaggerated perceptions of reality depicted everywhere from Instagram posts to glossy magazine covers. Like everyone, Rotter occasionally falls victim to the cloying allure of the many things she laments have “buzz.” The New York native recalls the rat race less than fondly. Over the course of her 13-year career (which also included stints in music publicity at Mexican Summer and Girlie Action), Rotter’s work has appeared as part of fashion campaigns for Rodarte, Target, Urban Outfitters and Converse. She’s designed album art for Light in the Attic Records, Third Man Records and even drew the cover for Best Coast’s 2012 breakthrough, The Only Place. She founded a company in 2007 called Rotter and Friends focused on designing t-shirts for bands, often from the ‘60s or ‘70s, that she loved and felt were underrepresented. Among those friends is DJ, reissue producer, former tour manager and Master of None Music Supervisor Zach Cowie. The two have been both colleagues and collaborators for more than a decade, and as Cowie says, “She and I have been saying, ‘I’m bored’ to each other for like 10 years! Rotter’s style of illustration is fairly minimalistic. She sometimes refers to her drawings as “scribbles” and how the stories intertwine as a “variety show.” Her work could be compared to a not-sexist R. Crumb (musically and stylistically) or evocative of Gapingvoid’s illustrated motivational posters. Emotionally, though, her work emphasizes characters and the existential crises they endure, conveyed though brief thought bubbles or pithy captions. Other characters include The Ostrich, donning a bolo-like necklace and pink boots, who tries to find the strength within herself to fight lonliness. There’s The Dog who seeks validation for being cool and The Robot who got its heartbroken and toes the line of ending it all. Although Rotter recently finished another Fruit Bats shirt, a major merch project for Cat Stevens/Yusuf Islam and has plans for an animated film, the lessons in I’m Bored still keep her steady and present throughout the upcoming book tour dates and everyday life.